Those making the trek to Illinois for Pond-O-Rama were well-rewarded. 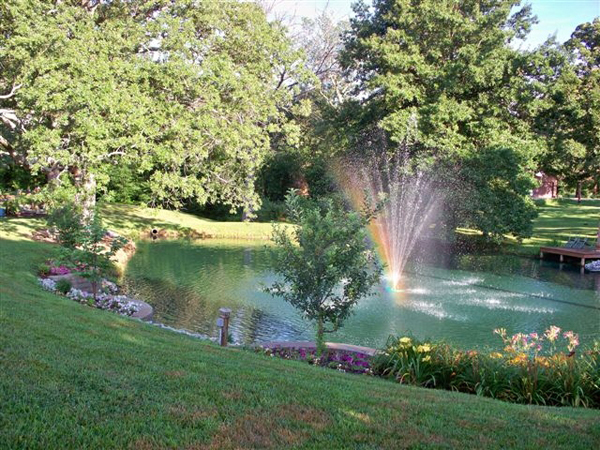 Frank and Margie Huffman’s three acres include a hillside of waterfalls and streams that solved a troubling problem, what they modestly call their ‘mud pond’, and a ‘moat’, with a bottle tree, and a fishing grizzly thrown in for fun. After serving for 30 years in the Navy and working in the Washington, DC, area for more than 25 years, we decided to return to our roots in Illinois and built our house on a 3-acre plot near Highland. The land already contained our first water feature: a quarter-acre “mud pond” which we had dredged to a depth of 13 feet. 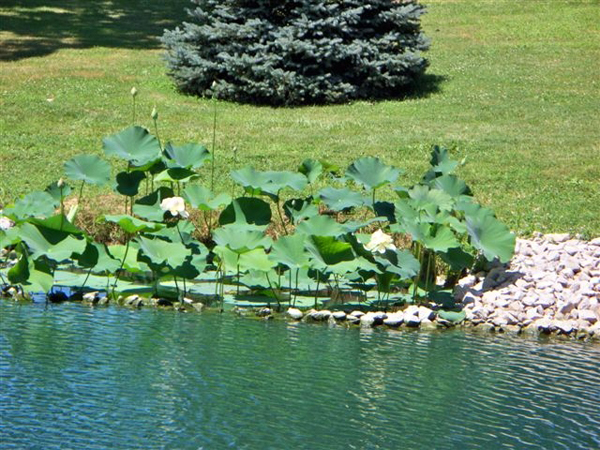 We added a lighted floating fountain, lots of catfish, a small dock and lighthouse, and (best of all) a lotus pond separated by a short rip rap wall from the rest of the pond. On the east and north sides, approximately 75 daylilies keep the weeds down and add bright colors in mid-summer. 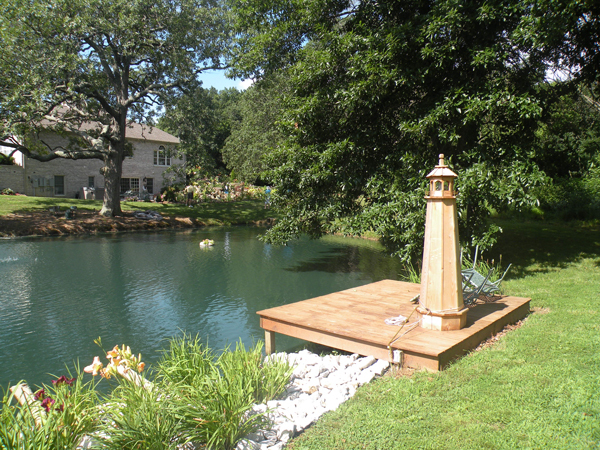 Our next project was what we call the “moat”-a 20′ long x 5′ wide x 3′ deep concrete pool (approximately 2000 gallons) with a bridge leading to the front entry of the house. 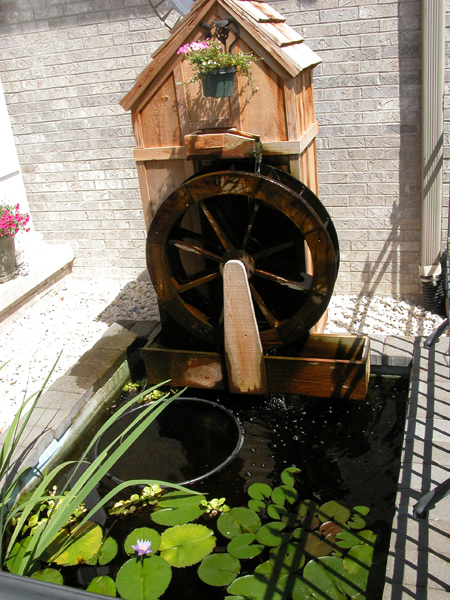 In addition to the usual water plants (iris, water lilies and spectacular pickerel rush) and fish (about 40), there is a working cedar water wheel which hides the filters. 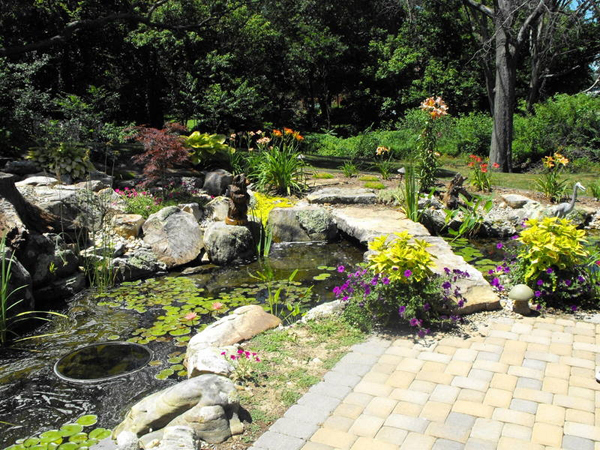 A massive 15′ stone bridge over the pond leads to a rock staircase and flagstone path. The path takes you along a 35′ stream and falls that spill from the top of a sloped hillside. 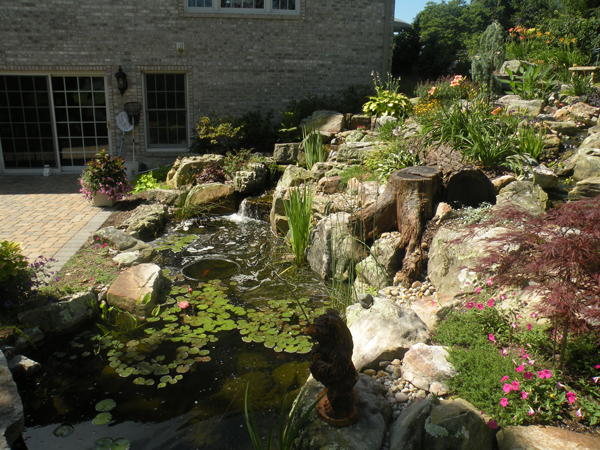 At a split in the stream you can get a topside view of another 25′ stream and 3 taller waterfalls that drop into the pond. 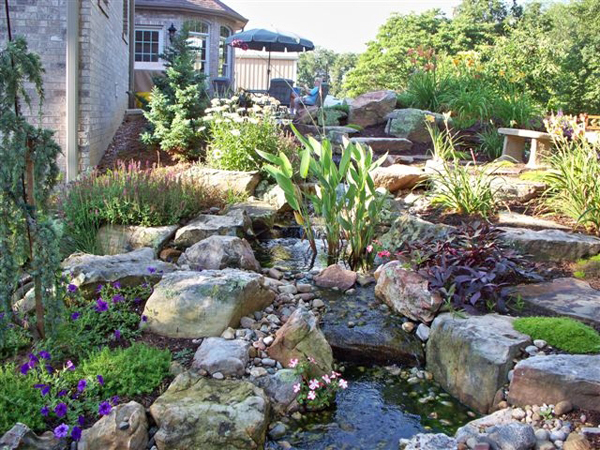 The stone path crosses the stream via a set of stepping stones and terminates at the upper patio providing a view of the water’s origin, a Signature 6000 Biofalls that looks like a natural spring. After Chris completed the project, we planted several different groundcovers, day lilies, hostas, veronica, daisies, ferns, etc. in the planting areas. We also added several trees (flowering crab, Japanese maple, Atlas cedar) and an unusual creeping juniper grafted to stock so that it resembles a tree. 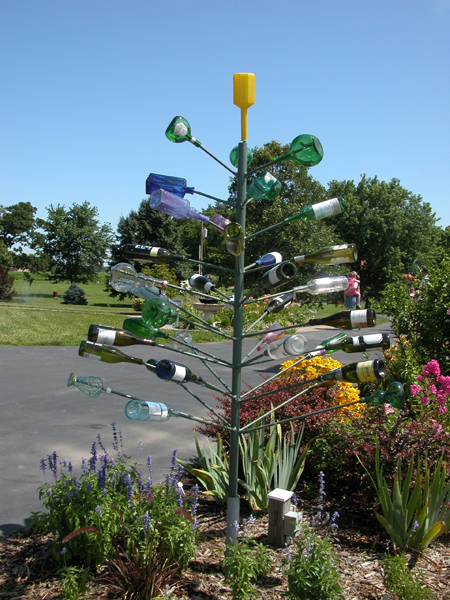 In our tour of Pond-O-Rama sites a couple of years ago, we saw a bottle tree for the first time. We liked it so much that we decided to have one made and put in our flower bed in the middle of the driveway. It is made of steel and has 36 bottles, many of which were obtained while traveling overseas (Germany, Spain, Portugal, Italy, the Azores). One of the Spanish bottles even has a set of castanets around its neck.